Lady V are excited to welcome the brand NEW Josie Dress to our Summer Collection! This stunning dress offers a truly feminine look with its sweetheart neckline with ruching detail on the bust, fitted bodice and full flared skirt. The lovely Josie Dress also features an off the shoulder sleeve detail, that can also be worn higher and turned into cute capped sleeves! This Pretty Peony Floral print is a beautiful and bright design made up of gorgeous garden flowers in a summery red and orange colour scheme on a white background. 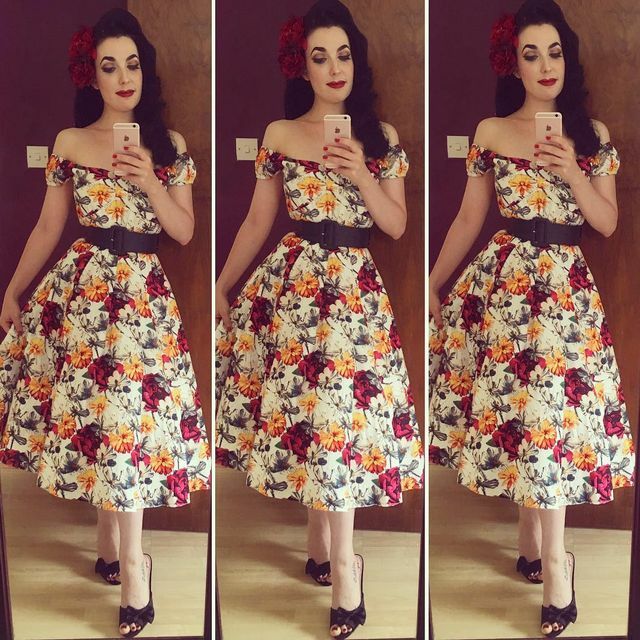 The Pretty Peony Floral Josie Dress is perfect for daywear and can be dressed up for more formal events by layering a petticoat underneath, to emphasise the fullness of the skirt. The Josie Dress measures at 42.75 inches from shoulder to hemline, in a size 8, and is designed to sit just below the knee. This dress is fastened with a concealed zip on the back and available in sizes 8 – 22.